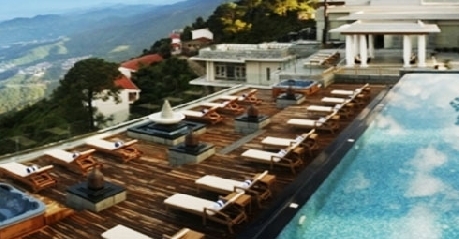 Moksha Himalaya Spa Resort is perfect for rejuvenation and relaxation. The guest here is offered with wide range of facilities and contemporary amenities that suits well with the modern style of living. 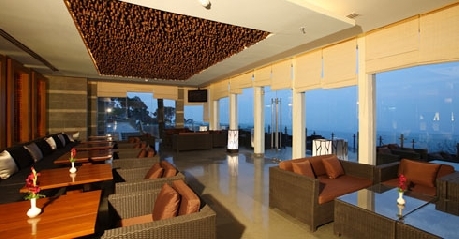 The hotel is comfortable for both business or leisure proposes. The intact facilities of bar/lounge, fitness centre with gym, children activities, spa, swimming pool and suite rooms does makes every stay an unforgettable one. 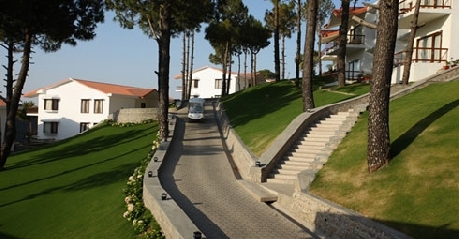 Situated in the midst of nature, the resort is perfect spot for spending blissful time with family or friends. The hotel has close proximity of various tourist destinations. The famous kali Mata temple, Gurkha Fort and Mughal Gardens is just few kilometers away. On request varied entertainment and sight facilities can be arranged by the management. The open air spa is an added attraction and makes the place worth a visit. The warmth of hospitality could be best felt here, the guest here are provided with the facilities of private balcony with large glass. 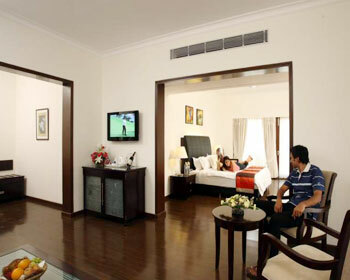 The luxurious rooms are designed spacious and the grandeur of elegance could be best felt here. The suite is carefully designed with the state of art infrastructure and modern interiors that suffices the needs of the guest. The attached bathroom of the suite is huge and well-equippe. 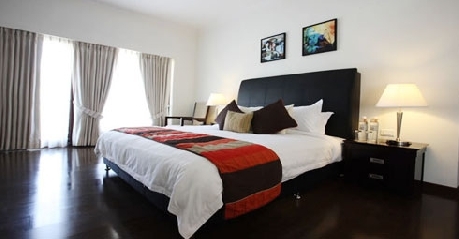 The room is tugged with various world-class facilities including Hair dryer, tea/coffee maker, mini bar, bathtub, LCD TV with multiple channels and much more. For the convenience of the guest everything is well placed and kept. 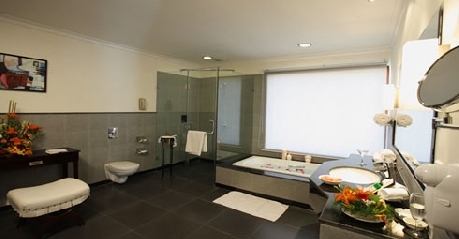 These rooms are offered to the guest in clean and hygienic condition and are extremely well-lit. Your stay becomes unforgettable because of the impeccable hospitality services and all the modern world-class comforts offered here. Treat your eyes to the surrounding beauty, from your room’s private balcony or window. The in-house restaurant is designed with complete opulence. The brevity of contemporary arrangements and comfortable sitting does gives an impeccable experience to every guest visiting here. The guest here is given the royal treatment of hospitality. Apart from the standard delicacies the skilled chefs here also believe in delighting the sense of the guest with newly innovated culinary. 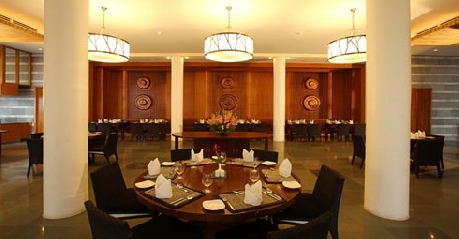 The restaurant here serves both vegetarian and non vegetarian delicacies. International and local the finesse of beverages are available here. relish delicacies of Asian, Indian and International Fares. The Moksha Spa makes you experience a serene earthy paradise. Forget all your worries and indulge in its luxuries. 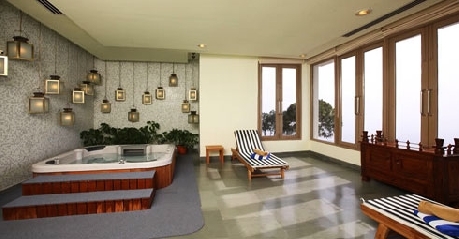 The soothing environment of the Spa makes it ideal spot for rejuvenating mind, body and soul. Experienced and skilled, national and international therapists, nutritionists and physicians pamper you through Ayurvedic treatments, Balinese treatments and European system of holistic health. This spa has special reserved areas full of modern amnesties for conducting these treatments. It also houses extensive amusing facilities like open air Jacuzzis, outdoor all-weather pool, modern fitness center and so on. Following treatments are offered for complete mental, physical and emotional wellbeing. (3 Day) Stress Management – It includes consultation with Ayurvedic doctor. The patient then follows a specific routine given below for all the three days. The person practices meditation for 10 minutes. It is followed by Abhyanga which means complete body massage using lukewarm medicated oil. It lasts for 60 minutes. After this, Shirodhara begins. It stands for intensive head massage in which herbal oil is poured on the head using a special vessel. Patients can use Jacuzzi or Steam Sauna which is optional. Sip in Stress Reliever Herbal Tea after Treatment. (5 Day) Stress Management – It begins with consultation with the Ayurvedic Doctor. Given routine is followed. For initial 3 days – the patients de-stresses via meditation and Abhyanga. Also, for initial 3 days – Meditation is followed by Shirodhara. For last 2 days – Meditation is followed by Choorna Swedanam in which muslin cloth carrying medicinal herbs are placed on your body. A full body massage is then carried out. Shirodhara is done immediately after this. Patient can use Jacuzzi or Steam Sauna which is optional. (5 Day) Detox and De-stress Program – Consultation with Ayurvedic Doctor on the first day is compulsory. For 1st 2 Days – the patient is made to practice meditation followed by Abhyanga and Shirodhara. For next 3 days – Meditation, Choorna Swedana and Shiro Dhara takes place. On the last day – Facial is done using herbal powders, scrubs and body wraps. 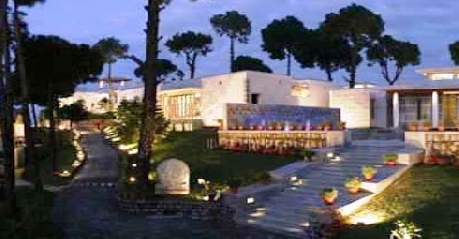 (7 Day) Detox and De-stress Management – It begins with consultation with Ayurvedic Doctor.